This visible image of Tropical Storm Lee was taken from the GOES-13 satellite on Saturday, Sept. 3 at 9:32 a.m. EDT. It shows the extent of Lee's cloud cover over Louisiana, Mississippi, Alabama and the Florida Panhandle. The clearing on the southeastern side is a result of drier air moving in and preventing development of thunderstorms. New satellite photos snapped by NASA and NOAA spacecraft are giving storm watchers an ultra-high view of Tropical Storm Lee as it pounds the U.S. Gulf Coast. The photos, taken by NASA's Aqua satellite and the NOAA's GOES 13 weather tracker were snapped at different times today (Sept. 3), revealing the intensity of Lee's severe thunderstorms and rainfall, NASA officials said in an update. NOAA's GOES-13 satellite view of Tropical Storm Lee shows the storm in visible light wavelengths 9:32 a.m. EDT (1332 GMT), revealing it to be a spiral-like mass of white clouds pounding the Gulf Coast. The Aqua satellite snapped an infrared view of the storm for NASA scientists, showing Lee's strongest thunderstorms over Louisiana and the Gulf of Mexico as they appeared at about 3:47 a.m. EDT (0847 GMT). This infrared image of Tropical Storm Lee on Sept. 3 at 3:47 a.m. EDT and showed the coldest clouds and strongest thunderstorms (purple) over southeastern Louisiana and the Gulf of Mexico. NASA's Aqua Earth observation satellite snapped this view. As of 8 a.m. EDT (1200 GMT) today, Lee was still churning off shore about 15 miles (25 km) south-southeast of Intracoastal City, La., and moving north-northwest. The storm had maximum sustained winds of about 60 mph (95 kph). 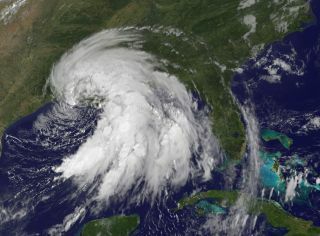 Gutro wrote that Lee is expected to pour rain on the states of Louisiana, Mississippi and Alabama for the next three days. It could spawn flash floods for regions in the southern parts of those states, as well as the Florida Panhandle. "Torrential tropical rains will continue to impact south Mississippi and southeast Louisiana through the Labor Day weekend," the National Hurricane Center warned in an update. Tornado watches and storm surge flood warnings have also been issues for many regions along the Gulf Coast, Gutro explained. Lee is expected to dump between 10 and 15 inches of rain on the Gulf Coast, with isolated pockets receiving up to 20 inches of rainfall, particularly along the Mississippi coastline, he added. Meanwhile, NASA and NOAA also continue to track Hurricane Katia as it moves across the Atlantic Ocean. Katia is a Category 1 hurricane with winds of about 75 mph (120 kph). That storm is expected to stay at sea this Labor Day holiday weekend, NASA officials said in a separate update.